I lived in Delhi, rather New Delhi in two phases. First as a student in the JNU campus for three years and then as a working professional for two years. I used to work for a human rights organisation and loved every minute most of it. Life was busy, no life was super busy. Since the organisation did crisis response; we were always on our toes. Our Delhi office was/is a crazy place, hyper active and chaotic, thriving on energy and adrenaline surges. In the middle of all the lawyers, rights activists and social workers, I was the lone ex-academic who seemed to have accidentally strayed into the world of activitism. I was always dumped with all the writing and managing jobs which the others in their action packed days of fighting court cases, rescuing victims, doing public meetings, training judges never had/found the time to do. For a Ph.D. drop-out used to spending days in musty libraries, breaking my head trying to understand opaque theories and labouring over essays, thesis, bibliographies...my job seemed pretty easy, fun even. Soon after joining the organisation I was baffled. I could not understand the stress people faced before going in to meet the big boss. Often we could hear screams from the big boss's chamber and papers being thrown. People who went in mostly came out with long faces, sometimes in tears. My time to take in a report I was working on came one late afternoon. I marched in, confident about the work I had done, yet a little terrified. Fortunately for me the big boss liked my writing and approved of the report. Unfortunately it meant more and more work. Along the line I discovered a boss who gave the term workaholic a new definition yet could be a lot of fun, did not suffer fools at all, loved teasing people, persisted in calling me 'Sushi' knowing full well it irritated me, raided my desk for food and mostly saved his screams for others. I was basically an overworked and underpaid professional. But I was not alone, so were all my colleagues. We were all grossly underpaid and mostly overworked. Though we cribbed about it endlessly, we did not mind much deep down. The satisfaction of working in the development sector, helping people in need, being in the middle of action, never getting the time to get bored was compensation enough. In the Delhi office we were mostly single, aged between early twenties to mid thirties and life was basically one long party. I shared a fantastic terrace flat with two girls from office, which was just a block away from our office. So it was the official party place and man the rocking parties we have had there. If not a full blown party, a group of friends would hang out together after office every evening. Because our salaries were meagre we soon learned to have low cost fun. In retrospect, I think the Delhi chapter of our lives could easily be turned into a chick lit. There was friendship, romance, heartbreak, dramatics, fights, companionship, struggle....the list goes on. Most of us have moved on, few friends still remain there. Few months back I came across an episode of Bikramjit Ray's Secret Kitchen where he went to the Bukhara Restaurant (among the world's 50 best restaurants) in New Delhi to try out their signature dish-- Murgh Malai Tikka. Now this is one of those restaurants which would have never been in our budget. But Bukhara being Bukhara I had read about it in lots of places. So I was curious. The recipe seemed fairly simple except that I did not have a tandoor. Taking the basic recipe, I tweaked it further and over the trials I have discovered a really easy to make yet one of the best chicken kebabs I have ever had. This is that dish you can quickly rustle up for a tasty dinner or wow your guests with. I am waiting to try this on the barbecue during summer. Switch on your oven to the highest possible. You can also do this in your BBQ machine or if you have a tandoor that would be ideal. Can also be done on the stove top in a non stick pan. Need about 2 table spoons of oil for frying in that case. Make the marinade by first mixing the cheese, milk (adding it a little at a time), cornflour, ginger and garlic paste, chillies, coriander stalks and salt. Make sure the marinade is not runny. Add the chicken and veggies pieces and marinate for half an hour or so. After half an hour, arrange the skewers, brush the chicken and veggies with egg yolk, spray some cooking oil and put it inside the oven. Please reduce the temperature to 150 degree Celsius. Grill till the chicken pieces turn light/golder brown (roughly 20 mins to half an hour, but then ovens vary, so please keep checking). A good squeeze of lime juice and some cilantro to garnish the kebabs. Serve it with a side salad as a starter or make it the main meal with a big salad. Milk makes the chicken pieces really soft, the cheese turns a lovely brown and adds its own flavour, the cornflour holds the whole thing together and egg yolk gives a lovely golden colour and makes the kababs silky smooth. Since there are no spices added in this kebab, the taste of milk and cheese dominate which is what gives this kabab a unique taste. No wonder this is Bukhara's signature dish. I wish I could make this for my Delhi friends and have another party in our beloved terrace on a balmy spring evening. Hope you had a good Holi and did get the time for do something special for yourself to celebrate Women's Day. Check out this special sari clad lady riding on a broom here. This is excellent. The photographs are also very good. Great recipe worth keeping. Thank you! Suchi, I know I can't comment on the chicken dish but all the same, I came here to read the little something that you write before the actual post, interesting read.. Thanks Hema, thanks for reading through even though you do not eat chicken! Hey Suchi, PLeassssse invite me next time you prepare this Murg Tikka :)! Simply awesome preparation. What a pretty plate! I love the vegetable flower you created. Have a blessed weekend. Your Delhi experience made me nostalgic about my own days in Delhi. The malai tikka recipe is awesome too, very different from the usual kabab/tikka recipes with loads of garam masala and other spices. I like the idea of chick lit days :D.. Coll & initial work days are always fun & it a very nice feeling to be a part of development team.. I loved the detailed writing.. transported me to my carefree days..not that i have become responsible now :D..(think like the phrase ;))..You know, can't comment on the dish though! 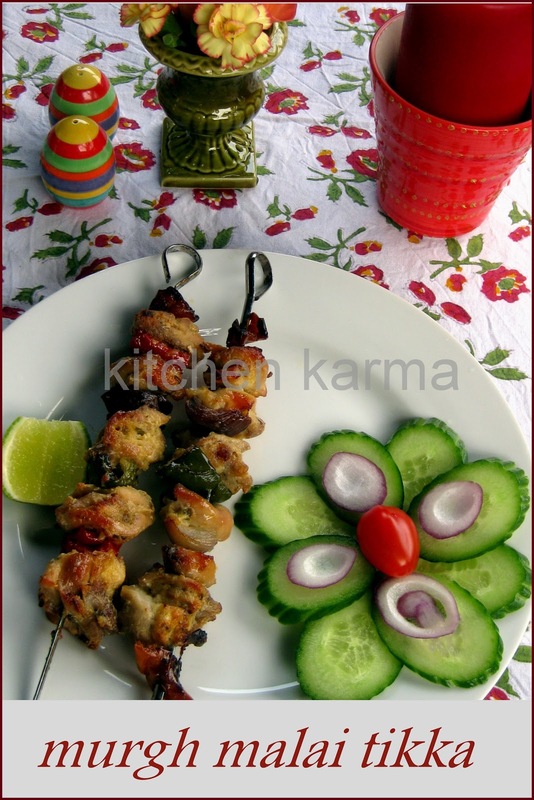 Droolworthy tikka..........nice post & presentation. I'm drooling! !They look succulent and love your presentation! Oh, these look so scrumptious!! I love the fact that these are so rich and creamy, but the spices are so minimal! Well done!! Your presentation skills are outstanding Suchi :) Great recipe! My hubby would drool over these pix, no doubt! Behind every successful blog there is a loving and supporting husband! At least for married women that stands true ;) Happy blogging! I like what how you described your experience with working in this organization! and the kebabs are so nicely served, good job! Kebabs looks so yummy n mouthwatering presentation. I love the way you wrote a story for the recipe and the pictures really enhance the yumminess. Love your shish-kebabs, so flavorful, and the spices are just the perfect addition that I love. Suchi, I left a msg. for you on my blog, to click on READ MORE...and you will see the recipe for both bean dishes. If you don't see recipe on the same page it will usually be on the following. Other bloggers have it this way, as well! You started a Ph.D programme? wow that means you must have taken your academics very seriously for a long time. With most people, i notice the pics first and writing later. With you, i finished reading the whole thing and read lots of comments that praised your pics and had to go back to take a closer look :) The pics are indeed lovely, the presentation beautiful and the orange rose awesome! We are spice lovers though and the husband stays away from most dairy, so this is not for us, unfortunately. 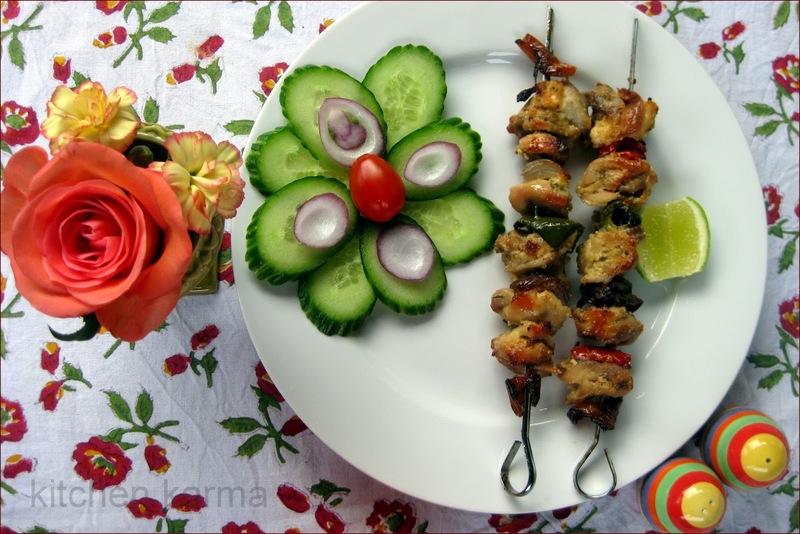 It is getting about time for some outdoor grilling and your kebabs do inspire. I really like the coriander flavoring with these. Also, interesting information about milk that I did not know. Delicious plating-yum! PS now your hundreth follower, sorry so later but better than never! I gave up non-veg some time back. Do not miss it, but can still drool over pictures! I love those images..First time here..I just started to follow u..
Do check out my blog and also add your blog to my blog roll..
ohhh wow...drooling here...what gorgeous clicks ! loved it dear ! That kebabs looks really appetizing ! Great nibble idea during summer picnic/bbq ;) Love reading the post ! oh wow! How well you write... and loved the kababs too! Nice click, looks delicious...Keep up the good work! Luvly picture..the murg malai tikka is my fav..Great going,suchi. WOW! Gotta start following this blog. The chicken kebabs look yuummmmmmmmmmyyyyyyyyyyy!! !